Things have gotten so bad that premier Rachael Notley has written an address to Albertans in major newspapers such as the Calgary herald where she details the problems facing our beleaguered oil industry. Notley lays out the predicament we are in and the possible solutions, although none are particularly good. There appears to be only two solutions if you can call them that. First the government can force oil companies to reduce production in the hopes that the excess oil sitting in storage will be drawn down enough to increase prices at least a bit. The other more radical solution being pursued by the government is to buy rail cars and locomotives to increase the amount of oil being moved out of Alberta on trains. From an industry standpoint, there are supporters for both ideas. Companies like Cenovous and CNRL support the idea of cutting production because they are only in the business of producing oil and are held hostage to the price differential, while Imperial Oil and Suncor are against the idea because they have refineries and gas stations and continue to be profitable. They are actually benefiting from the low price of crude because they can convert it to gas and diesel which they can sell at a decent price. Should gas prices still be around $1.00 per litre with oil prices so low? While it may seem that the radical environmentalists have won the war they have been waging to shut down the Alberta oil sands, getting more oil to market with trains is definitely not environmentally friendly. The risks of a spill from a derailment is much higher than it would be with a pipeline, not to mention the dangers of all that oil burning near or in a populated area. This is what happened in Lac Magantic Quebec in 2013 when 47 people were killed and many others were wounded physically and mentally. So, if the environmentalists really care about the environment, they cannot claim a total victory, at least not yet. Are there any other solutions out there? What about trucking the oil out of Alberta? That is happening, but the capacity of a single truck is not that much with only about 250 barrels fitting into a tanker trailer, while a train with 100 cars can hold anywhere from 60,000 to 100,000 barrels. Trucking is also much more expensive than rail or pipelines since each truck needs a driver and burns fuel to get to its destination. It seems that most of the oilfield trucking capacity is used to move oil shorter distances within the province. It all comes down to one basic fact - pipelines are by far the best way to move oil but politicians only care about being re-elected, so they constantly do the math on which seats they could gain or lose depending on the decisions they make. If voters in Vancouver, Toronto, and Montreal, don't want pipelines, there will be no pipelines. Also, the radical environmentalist have a lot of money and influence and have embedded themselves in many governments including the provincial NDP and the federal Liberals. Trudeau has said he wants to phase out the oil sands, so can we really believe he wants a pipeline built? Does the rest of Canada care enough to force the Liberal government to find a way to get at least one pipeline to be built? I wouldn't hold my breath. Posted in Uncategorized on December 1, 2018 by Justin. Does Your Business Have a Professional Voicemail Message? Maybe you never thought about it, but the way you present your business through the telephone is very important. If you or your receptionist don't answer your phone in a friendly and professional manner, you could be losing business. Would you like it if you called a local business like a plumber or dentist with the intention of making an appointment, and the person that answers the phone is rude and abrupt? If they are like that before you even hire them to provide a service, what will they be like once you have paid them some money? The same theory applies to your voicemail greetings and prompts, as well as your on hold message. If you call a business and get a voicemail recording, that is ok as long as the greeting is informative, friendly and assures you that someone will get back to you promptly. However once your prospective client is waiting on hold, it is not a good idea to just play some elevator music or a radio station while they wait. Isn't it better to use this time to inform them of your products and services while they are waiting? You could let them know how to book an appointment online or find the answers to their questions on your website. Maybe you could explain how to find your office and add little details like "we are next to the Walmart" or "turn left on Henderson street". The quality of the messages often gets overlooked by small to medium sized businesses. They usually just have someone on staff record the messages and prompts, however they don't sound very professional. Lets face it , if you are not able to answer the phone when a person calls, your voicemail greeting will be their first impression of your business. Make sure that impression is that your business is good at what it does and takes their business seriously. It is similar to having a poor website. That can tell a potential customer that you are not an important player in your industry if you can't even get a good looking and professional website that also looks good on a mobile phone. There are companies that offer this type of service complete with your choice of a female or male voice. They have professional studios with all the best sound recording equipment to record your message, greeting or prompt. Some will even let you order your professional voicemail greeting online. All you need to do is choose a voice from their list of great on air talent, and upload your script of what you want your messages to say. They record your greetings and notify you when they are available for download from their website. This type of service can be quite affordable and lets you standout from the competition when it comes to telephone messages, prompts, and greetings. Posted in Uncategorized on February 2, 2016 by Justin. Should You Buy a House with Stucco or Vinyl? Virtually all new homes being built today in Calgary either have stucco or vinyl siding. If you venture into some of the older neighbourhoods such as Acadia, you will find mostly wood siding on the houses, and most of those will be bungalows. Some of the newer neighbourhoods like cranston will have a mixture of of stucco and vinyl siding. I personally think that a mixture like that doesn't look that great, so all the houses on a particular street should be one or the other. It is fine if you have one section of a community with stucco and another section with vinyl, but you shouldn't have a vinyl house beside a stucco house. This product is very durable and lasts a very long time in Calgary's harsh winters. Looks much better and you get a more sophisticated and expensive looking home. There have been quite a few stories about condos having stucco problems in Calgary and Edmonton. Basically what happens is that the people that installed the stucco did a poor job and moisture ends up getting in and causing problems. As you can imagine, the cost to fix these problems on buildings that are 4 storeys or more tall can be very high. Usually these problems are found after a few years so it is difficult to hold the stucco company responsible since some have gone out of business or simply don't operate in the province anymore. Legal action take a long time, so it is the poor individual condo owner that has to pay in the form of a special assessment. Normally a condo board will budget for repairs they know will be required in the future, such as a new roof. A stucco problem is not in the budget so the condo board has to ask for a specific amount of money which can run in the thousands, from each owner. This special assessment is on top of the owner's monthly condo fee. That is why it is so important to make sure your stucco contractor knows what they are doing. I just wanted to inform our readers that although I love the look of a stucco home, and I live in one, that you have to do your research on whoever you are going to hire or in the case of a builder, who they already hired. This is even more important if you are buying a condo. Posted in Uncategorized on October 16, 2015 by Justin. Here we are in the middle of March already and before you know it we will all be making a mad dash to the post office to mail our tax returns, or pressing the submit button if we file electronically. I have always found that if you are organized you can save a lot of grief and stress. Nothing is worse than diving into bins and boxes of receipts at the last minute while trying to meet the deadline. This is expecially true if you own a small business. If you are an employee and just have a T4 and maybe an RRSP slip you can just buy one of those programs at the grocery store and easily file your return. For a business the complexity goes up by a factor of about 10. Keeping track of all your business expenses while recording all your revenue requires at least the use of an Excel spreadsheet and preferably some business software like Sage 50 . The Sage software enables you to keep on top of payroll, expenses, and revenue although there is a fairly steep learning curve with the software. If you are an individual that gets a T4 from a company, then I do recommend tackling the project yourself either with an old fashioned paper return or the $30 software you get at Superstore. If you have a small business, then I would recommend you hire an accountant to this work for you. You can track everything yourself with the spreadsheet or Sage 50 software but get the accountant to file the return for you. There are a lot of things that you could screw up, and unless you want to spend several days or weeks learning about dividends and capital cost allowances, an accountant will be worth the money. Especially if you were to make mistakes for several years and then have to go through an audit - then the mess would just be multiplied. Posted in Uncategorized on March 17, 2014 by Justin. What’s Happening with the Real Estate Market? It is hard to believe we are already into the third week of February and the winter Olympics are almost over. What a great hockey game that was this morning between the Canadian and American women's hockey teams. I thought we were done and would have to settle for the silver, but I kept a little bit of faith and continued watching until Canada scored with about 3 minutes left in the 3rd period. Anyway if you missed it, we tied it up with about a minute or so to go and then went on to win in overtime - great game. Anyway, I was going to talk about Calgary real estate so here goes. We're in a seller's market with very low levels of inventory. As of today, February 20th, there are only 1015 condos on the market which includes all apartment style condos and townhouses. As for single family homes which includes detached houses and duplexes, there are 1839 homes for sale. So, if you have a good home to sell and price it reasonably, it will sell quickly and possibly with multiple offers. Prices have now recovered or even exceeded the record highs we saw in the last boom in 2006 and 2007. I spoke to Carmen Paradis of RE/MAX real estate central about some strategies you can use to buy a home in this market. She said the most important thing is to have your financing ready to go and know exactly what you want in a home. You have to be ready to pounce before someone else makes an offer. It is the biggest purchase you will likely ever make but if you find a place that you love, do not wait a few days to think about it. Don't wait until the weekend to go see the new listings, that is when everyone else will be out as well and those people will be making offers. Paradis says go during the week and make an offer as soon as you find your dream home. Chances are that if you love the house, so will a lot of other people and it will likely be gone by the time you pull the trigger on the weekend. Don't expect things to change any time soon as mortgage rates are still very low, and people are still moving to Calgary in droves. Rental vacancies are very low and monthly rents are very high because of the insatiable demand. As long as the oil industry continues to do well, the real estate market will be active. Prices are increasing, but don't expect huge price increases because people have long memories and remember what happened after the last boom and during the recession. House prices declined significantly and have only recently recovered to their highest levels. So it is full steam ahead for Calgary's property market for the foreseeable future. Posted in Uncategorized on February 21, 2014 by Justin. Alberta is set to implement it's controversial carbon tax on Jan 1, 2017. This tax will affect the cost of almost everything we buy. The first thing most people will notice is the jump in the price at the gas pumps which will be around 6 cents per litre. The one positive side effect of low oil prices has been low gas prices, and now they are going to increase that for questionable reasons. Next, we will start to see increases in prices of food, clothing, transportation and anything that has to be shipped by train, truck, or plane. We will also see costs increase for taxis, flights, transit and shipping costs for anything we buy online. Even if the NDP under Rachel Notley had a change of heart and reversed their decision to plow ahead with their controversial tax despite the fact that the Alberta economy is in bad shape right now, we would still have to worry about Justin Trudeau's looming tax in 2018. Trudeau has decreed that every province must have some sort of carbon levy in place by then. He has also said that the price on carbon will rise every year for five years. It will start at $10 per tonne in 2018 and go up by $10 per tonne every year until 2022 when it will top out at $50 per tonne. Another consideration is how fair will the tax be on citizens of the various provinces? Quebec and Ontario are using a cap and trade system that trades carbon and credits with California. This type of system has been proven to be vulnerable to all kinds of corruption everywhere it has been tried. Also there is plenty of evidence that the resource producing provinces like Alberta, Saskatchewan, and Newfoundland will be disproportionately affected since much of their economies revolve around energy. By 2022 the average Canadian could be hit with $2,569 in additional taxes because of this carbon levy. The actual number will vary from province to province and household to household, because there will be credits paid back to lower income families, but rest assured everyone will pay more. So, what are the benefits to the environment? There are none. Canada is a vast and cold country, so people will still need to drive, buy food, heat their homes, ship stuff, and live their lives. There will be no reduction in carbon emissions just because there is a tax on it. In the case of cap and trade, you are paying someone so that you can emit more carbon in the hope that they will emit less. That is a system that is just waiting to be abused. There is also the fact that Canada is responsible for only 1.6% of global emissions, so even if we eliminated 100% of our emissions, we wouldn't make much of an impact. Sure we can try and be an example for the rest of the world, but at what cost? When we implement taxes just to feel good about ourselves, we make our businesses less competitive with the United States and other countries that have not purposely hobbled their economies. Posted in Uncategorized on December 13, 2016 by Justin. By now, everyone has seen the worst example of art you could ever find in the city of Calgary. I am talking about the great blue circle that sits beside the road at 96th Avenue near Deerfoot trail in the northeast. This thing is a source of embarrassment for Calgarians simply because we allowed our elected officials to spend our money on something like that. Even though mayor Nenshi says he hates it too, and it was approved before he became mayor, it happened on his watch, so he bears some of the responsibility. This all happened because of the city's policy of spending 1% of the cost of a project on art, for projects that are at least 1 million dollars. The whole idea behind this policy is a good one, since we all want a beautiful city, but the bureaucrats have taken this idea a bit too far. In the case of the big blue ring, they say that 5 citizens picked the winning piece of art that was approved for that location. Well who were these 5 people? I think there should be a lot more citizens involved in the process to ensure that people from all walks of life can make a choice that most people can be happy with. Were those 5 people lovers of modern art? If you had 50 people in a group that included plumbers, construction guys, doctors, teachers, and every other profession, this ring would never have been approved because normal people do not like it. They would have approved something that the majority of Calgarians would have been at least ok with. Unfortunately this is not the only extreme example of taxpayer waste when it comes to spending money on art. There are numerous other examples such as the one I discovered when I was on a bike ride the other day in the Southeast near Lake Sikome. I was following our city's wonderful bike paths and ended up riding under an overpass. To my surprise I found this example of what some would call art, I guess. I had to stop and take a picture and I had to wonder how much someone got paid for this "art" It was made of pieces of granite that you would use on your counter tops, rocks, and tiles with metal borders. Really, I think an 8 year old could have made this without too much trouble. 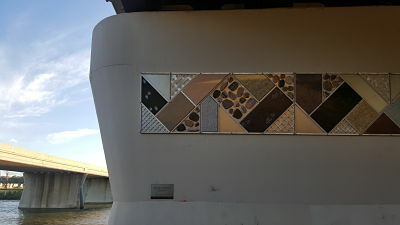 If we did a quick calculation based on the city's 1% of the cost of the project starting at 1 million dollars, this artist would have gotten paid at least $10,000. Although if it was based on the price of the bridge, the cost would have been much more. Another example is money being spent on sewage facilities as outlined in the video below. Why not give us more things like the lions on the Centre street bridge, or the fish on the walls as you drive on Glenmore under Macleod Trail and Elbow Drive, or even the controversial Peace bridge. That one was only controversial because of the cost, and the fact that a foreign architect was hired to do the job and much of the construction work was done out of the country. Posted in Uncategorized on August 20, 2016 by Justin. 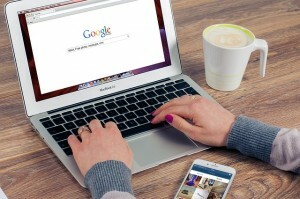 Does Your Business Use Online Marketing and SEO? So you went out and spent a couple of thousand dollars or more on a fancy new website that you think really helps to portray who you are as a business. But is that investment paying off with more phone calls, email enquiries, and sales? That is what your website is supposed to do for you when you utilize online marketing. On it's own, your website is nothing more than an expensive business card that no one can see. When combined with online marketing or SEO your website can become a lead generating machine. SEO stands for search engine optimization and it utilizes certain tactics to get your website found on the first page of Google and Bing. Think about what a potential new client would type into a search engine when they are looking for the services that you offer. For example, if you are a dentist, a person would probably type "Calgary dentist" into Google if they don't already have a dentist. So go to Google and do exactly that, and see if your business comes up on the first page. If it doesn't, then you are missing out on a lot of new patients. Almost no one even looks at page 2 or page 3 because there are enough results on page 1 for them to find someone that suits their needs. If you are not a dentist just substitute your business niche for dentist. For example if you are a plumber, type " Calgary Plumber" and if you are a roofer, type "Calgary roofer" - I think you get the picture. So, how do you do this? Well it is not easy and the techniques used, change all the time because Google and Bing change all the time. They are constantly updating their algorithms (big computer program) that determine which websites get the top spots on page 1. There are basically two parts to SEO. You need to adjust and optimize your website to make it clear to search engines what your website is all about. This can be done by changing titles, adding descriptions, and adding great content. You need to make sure that your website is popular with owners of other websites so that they will link to your website. For example, if you have great content, another website that is writing about a similar topic may want their readers to read your article as well, so they will provide a link to your website. You also need to attract attention from social media users so that they will like and share your website and content to their friends. This is all pretty tedious and time consuming so it is best to hire a reputable Calgary online marketing company to do it for you. Just make sure you ask for proof of results with other Calgary companies and even ask if you can call some of their existing clients to make sure that they are getting a great return on their investment. Posted in Uncategorized on April 19, 2016 by Justin. Are You Starting A Business in Calgary? With the local Calgary economy suffering more than it has since the eighties, there are a lot of people that have been thrown out of work right now. It seems that a day doesn't go by without me hearing about or talking to someone that has been recently laid off from their job. The shocking part is that a lot of these unfortunate people that I have talked to didn't work in the energy business. A lot of them worked for companies that have been affected by collateral damage from rock bottom oil prices. The unfortunate fact is that this is how an economy works. If two parents both have jobs, they will be paying someone to look after their children when they are at work, but if one or both of them loses their jobs, then there is no longer a need to pay for childcare. That is one simple example of how the fallout from the distressed energy sector can trickle down to other industries. Banking, real estate, construction, and pretty much any other part of the economy are also affected. So, if you are one of the many individuals that have been impacted by the downturn, you probably have realized by now that there are not a lot of jobs to be had. There are exceptions depending on what industry you are in, but for the most part, the hiring outlook is pretty bleak with the city's unemployment rate at 7.9% which is the highest it has been in 20 years. With Calgary being an entrepreneurial city, many people are considering starting a small business. Why not take matters into your own hands if you have no other options? If you have been in the workplace for a number of years, and have some kind of educational background, chances are that you have something to offer to someone out there. It could be a construction service where you bid for small jobs that the larger companies don't want, or something like a carpet cleaning business, business consulting, food truck, marketing, or anything else you can think of that might be in demand even in a slow economy. You need to think about whether your specific expertise can solve a problem for a decent amount of people in Calgary. It could be that there is just no market for the services that you can provide, but on the other hand there could be a tremendous need and you could be one of the people that can take advantage of that. As a small business just starting out, you may have to go after smaller jobs just to establish yourself. You can do something as simple as advertising on Kijiji to get your first few clients and scale up the business from there with your own website, online marketing, telephone system, and print advertising. If you do decide to become an entrepreneur, there are several things you need to do first. 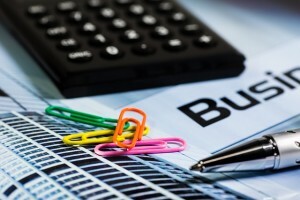 Will your business be a sole proprietorship or will you incorporate your business right away? If you are going to start as a sole proprietor, and you expect to earn less than $30,000 then you do not need a GST number. However, if you are incorporating your business right away, you will need a business number with a GST number from the CRA. Do you need a business license from the city? Depending on what your business does, you may need liability insurance, and there may be a requirement that you participate in the workers compensation board, and other provincial certificates. This is all explained in the video below. Posted in Uncategorized on March 15, 2016 by Justin. It may be colder than it is on one of Neptune's moons right now in Calgary, but it is never too early to start dreaming about spring. Sure it is only January 8th but spring will come eventually, although you never know with Calgary weather. We could have dry streets by April or we could have snow on the ground in May, but that is just one of the things you have to deal with when you live here. There are always a lot of things to do in the great outdoors around Calgary in the summertime, and one of my favorite things to do is ride motorcycles out in the country. Maclean creek near Bragg Creek has a lot of wild areas to ride and the scenery is great too. If you want to get a head start with planning your summer adventures head down to the BMO centre where the Calgary Motorcycle show is going on this weekend. The hours are from noon to 9PM on Friday, 10AM to 8PM on Saturday, and from 10AM to 5 PM on Sunday. Posted in Uncategorized on January 9, 2016 by Justin. Here is a video by a guy that has a dashcam and seems to have nothing better to do than drive around town recording bad drivers. Maybe we should all get one because we have all seen stuff similar to what is on the video. We also have to admit that sometimes we are the ones at fault Watching stuff like this can help to teach us what not to do, and maybe pay more attention to what is going on out on the roads. Posted in Uncategorized on April 12, 2015 by Justin. Are You Better Than This Driver? This women in Calgary made national and international headlines last month when this video surfaced of her trying to get out of a parking lot. That got me thinking about how some people ever passed their drivers test. I mean seriously are you not supposed to be able to parallel park to pass the test? If you could do that then surely you could get out of this parking lot. Posted in Uncategorized on January 28, 2015 by Justin.